Added on January 21, 2019 by Jaime Permuth. 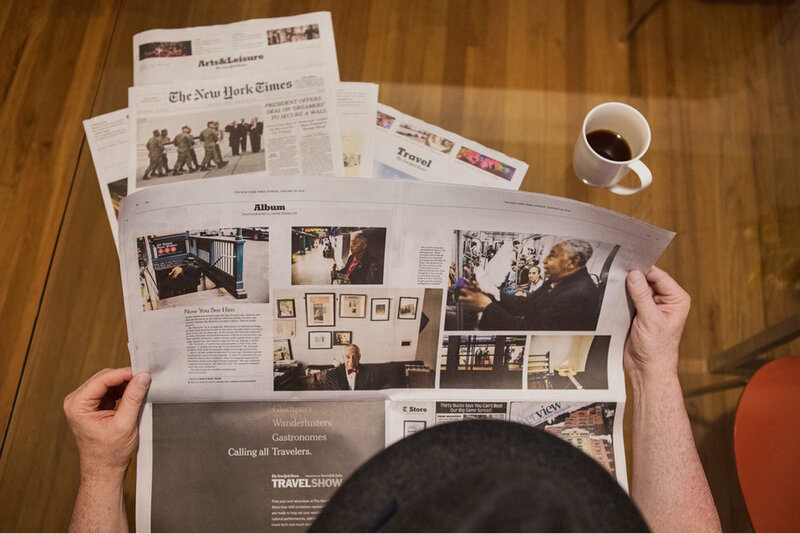 That first cup of coffee on a Sunday morning never tasted better, waking up to find a feature of my work in the New York Times! The Metro Section is indeed the pulse of the city. And David Gonzalez, who wrote the piece which accompanies my photographs, is one of the quintessential New York voices, who for many years has explored the richness and complexity of Latino life in New York. Seen here are images from my most recent project, a work-in-progress, entitled "Olmedini El Mago". The series is a photographic document of Olmedo Renteria “Olmedini”, a 78 years old blind magician: his faith, determination and grit as he works the subways of New York City to make a living. A selection of images was also published in the NY Times LENS on Jan 11th, 2019. Added on January 11, 2019 by Jaime Permuth. My latest body of work gets its debut feature in today's NY Times "Lens". "Olmedini El Mago", is a photographic document of the life of a 78 year old blind magician as he works the subways of New York City to make a living. It will also run in print on Sunday, January 20th in the paper's Metropolitan Section. I am particularly proud to have my photographs accompanied by an essay by David Gonzalez, one of the essential voices which define the life of this city for many of us.